When it comes into contact with water, the potassium alum crystal transforms into a non-allergenic deodorant and disinfectant that prevents the formation on the skin of odour-releasing bacteria. The Finesse roll-on for men, formulated using potassium alum comes in the ideal size for easy use in the home, when travelling or wherever it's needed. Take it everywhere you go: it's perfect for creating a sense of natural well-being that lasts all day. It is alcohol- and fragrance-free, safe, and does not leave marks on your clothing. 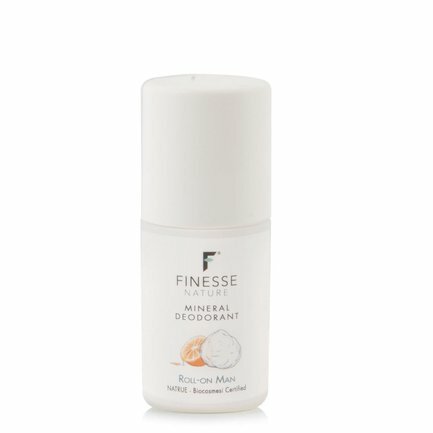 Finesse specialises in the creation of natural deodorants and cosmetic products made using potassium alum, a crystallised mineral salt of volcanic origin with properties that have been recognised since ancient times. All Finesse products are designed to preserve the balance of the skin, by protecting it with the antiseptic, antibacterial and hypoallergenic properties of the crystals. These results have been achieved through constant research aimed at identifying natural formulations which respect the skin and provide a true alternative to the more common products which irritate sensitive skin.